Nepal Bhutan India Adventure Tour with Pink Mountain Treks and Expedition allow you to discover fascinating history and impressive architecture, stunning views of the Himalaya and exciting drive, this adventure tour to the famous landmarks of India, Nepal and Bhutan, will be an outstanding experience for you. Nepal Bhutan India adventure tour is a beautiful Himalayan cultural journey that will take you from plains of the incredible India to the mountainous landscape of Nepal and the last Shangri-la on earth – Bhutan, where you will experience great contrasts along the way. Nepal Tour with excursions to Lumbini, the birth place of Buddha, Jungle Safari in Chitwan National Park, UNESCO World Heritage Sites in Kathmandu plus the Himalayas. India Tour with Major tourist attractions are Taj Mahal, Varanasi and Jaipur. Explore some of the finest examples of the Mughal and Rajput architecture in Agra & Jaipur and also the abandoned city of Fatehpur Sikri and Hindu death body cremation center Varanasi. Delhi, Jaipur - Amber Fort. Chitwan National Park - Elephant Safari. Kathmandu Valley - Bodhnath Stupa. Bhutan - Paro - Thimphu - Punakha Dzong - Taktsang Monastery - The Tiger’s Nest. Day 08:Drive to Lumbini in Nepal. Visit Lord Buddha's birthplace. Day 1Arrival Delhi - IndiaArrival in Delhi – India. Meet with representatives of Pink Mountain Treks and Expedition then transfer to Hotel. Day 2Exploring DelhiVisit the old and new Delhi. The Red Fort built by Emperor Shah Jahan. Jama Masjid which is the biggest mosque in the India. Raj Ghat the memorial of Mahatma Gandhi. We will walk along Chandni Chowk which is the silver street of Delhi bustling with activity. The India Gate an Arch of Commemorative victory. The Presidential residence Rashtrapati Bhavan. Government buildings of the secretary. Connaught place, commercial and managerial center. Day 3Drive to Jaipur and visit the cityAmber Fort. Day 5Jaipur – AgraSightseeing in Jaipur. Drive to Agra - The Taj Mahal. 6th night - train to Varanasi. Day 7Explore Varanasi's old town areaExplore Varanasi's old town area and enjoy a sunrise boat ride on the Ganges River. Day 8Drive to Lumbini in Nepal. Visit Lord Buddha's birthplace.Drive to Lumbini in Nepal. Day 11ChitwanDrive across Nepal's Terai region. Chitwan National Park one of the Asia's finest national park. Day 13Chitwan - KathmanduOn day 14th and 15th - visit Boudhanath Stupa and Pashupatinath Temple. a. The monkey Temple of Swayambhunath. 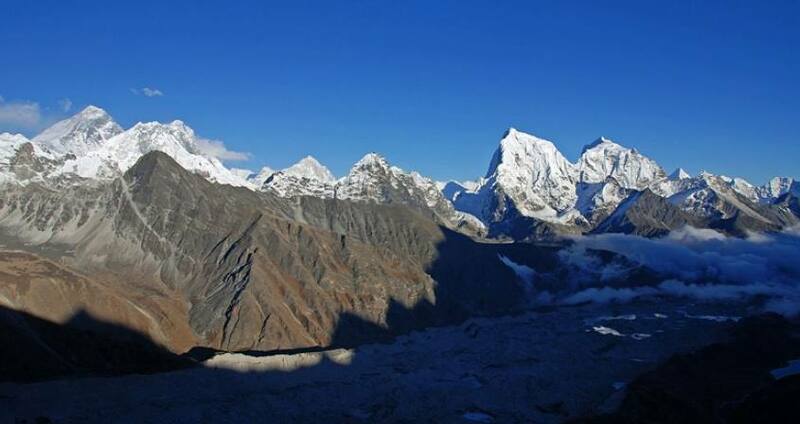 Option for scenic flights for views of Mount Everest is also available. Day 16Spectacular flight along the Himalayan range to BhutanSpectacular flight along the Himalayan range and land in Paro, Bhutan. Drive to the capital city of Thimphu. Explore the fortress and painting schools in Thimpu. Day 17Drive to Punakha valleyDrive to Punakha valley which is a great chance to see Bhutan's beautiful countryside. Go via Dhachu la pass. Day 18Drive to ParoDrive to Paro. Visit the Taktsang (Tiger's Nest) Monastery. Explore the local villages and countryside.